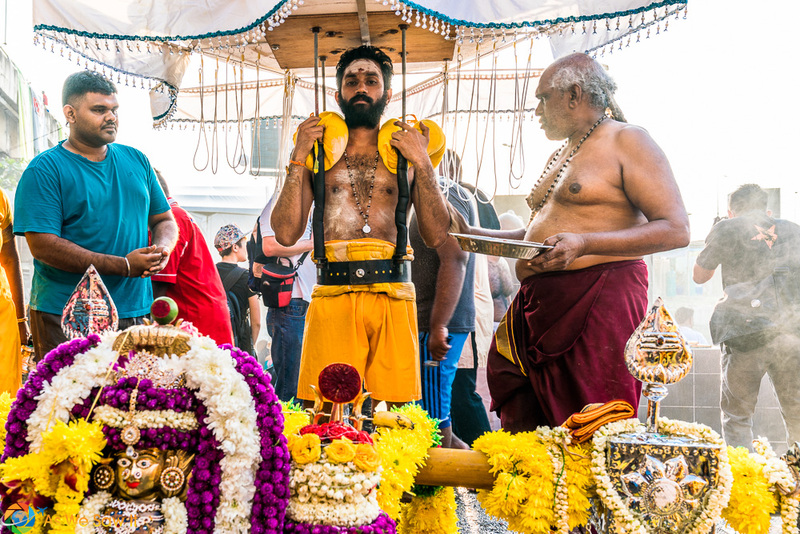 How do you photograph the Hindu festival Thaipusam at Batu Caves, a site you've never visited before, with more than one million people in attendance?This, following the challenge of getting up at 4:00 a.m., only to learn the hard way that trains don't run that early in Kuala Lumpur. Time for Plan B: Find an Uber driver who is awake that early and willing to take us up to Batu Caves, on the city's outskirts. 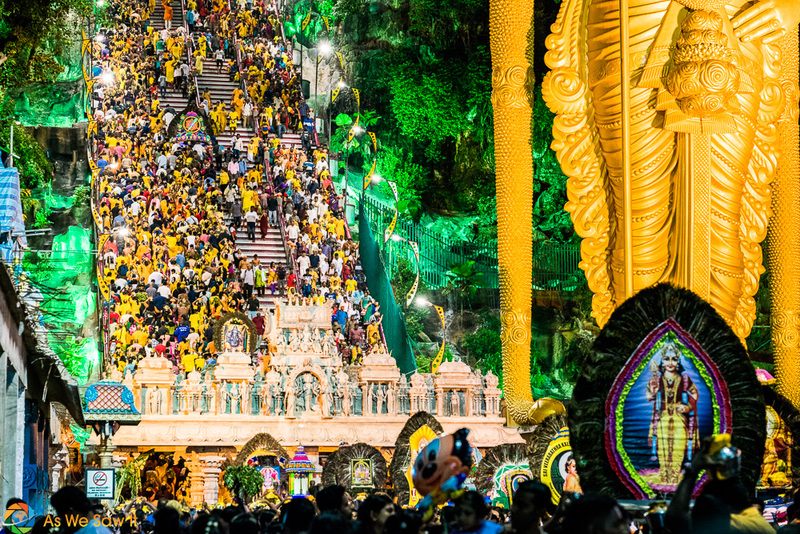 Ascending up to Batu Caves, millions of the faithful believers carry their offerings and burdens up 270+ stairs. The line is already more than 1 mile long at 5:30 am. The darkness and motion add to the challenge to capturing the scene. Take your fastest lens and bump up your ISO to give yourself the best chance. By all means shoot a ton of images to maybe get one or two before the sun rises. Pay attention to what is going on around you. Here, the two ladies in the lower right are about to be pushed out of the way by the burden-laden worshiper coming up behind them. Understand the noise is in the shadows, but at 5 am, there is darkness. Relax a bit and focus on what color you are capturing instead. Pay special attention to lens flare at this time of the morning. Our vantage point was between a sea of people moving in both directions. 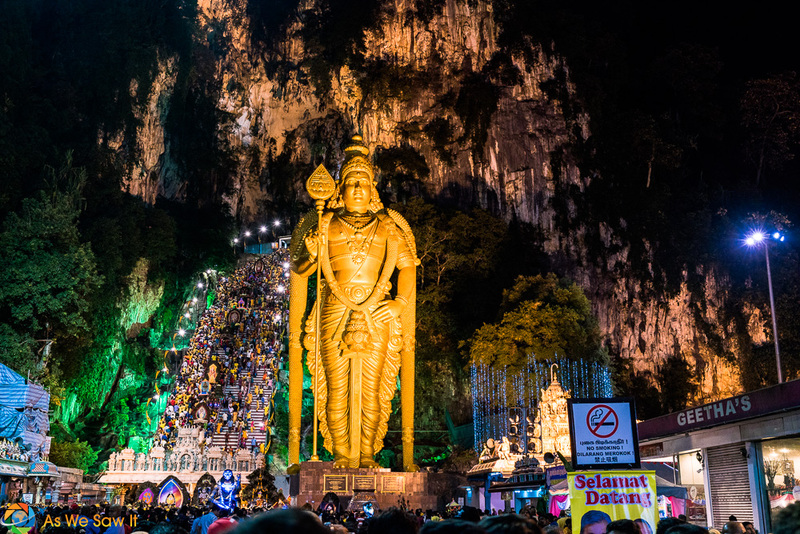 This spectacular night shot of Batu Caves shows a throng of people queueing to climb those stairs on one side of us, and coming back down on our other side. 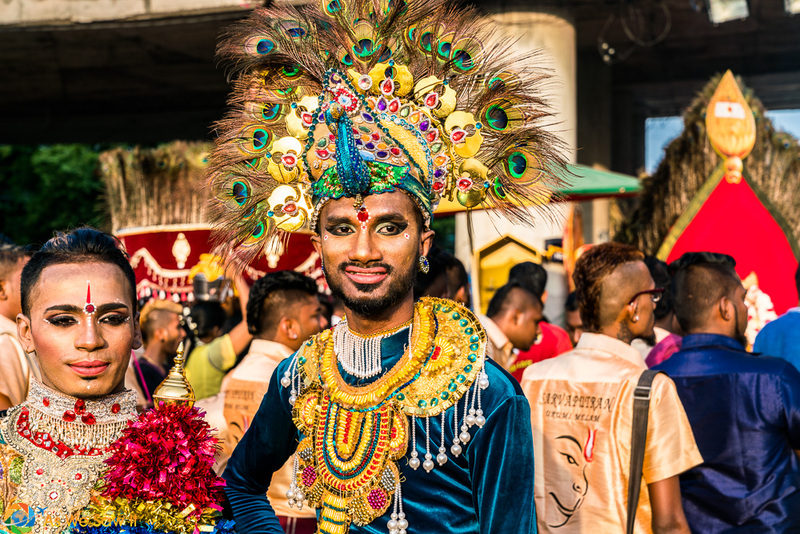 It is important to keep in mind you are there to photograph Thaipusam and not be a part of the ceremony. Flow with the crowd. Keep your eyes moving and be ready to instantly snap a shot, because it is gone in an instant. 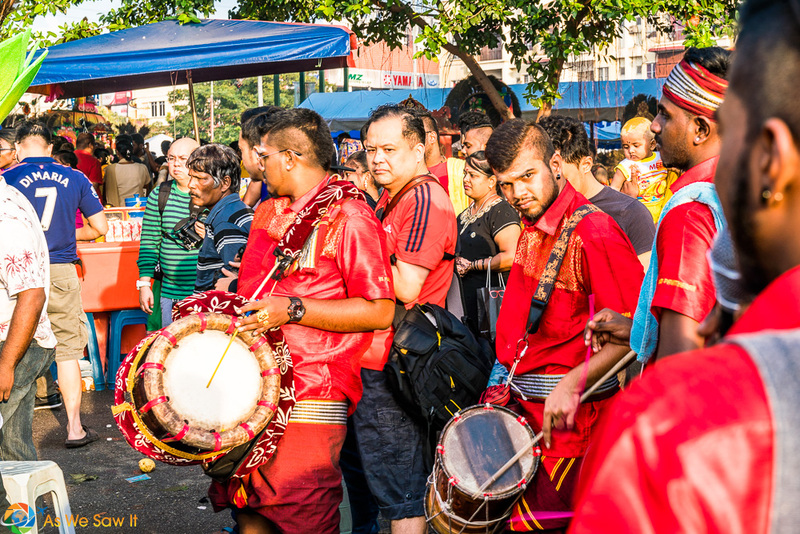 In this case, we were facing the procession towards Batu Caves, moving with others in the same direction. 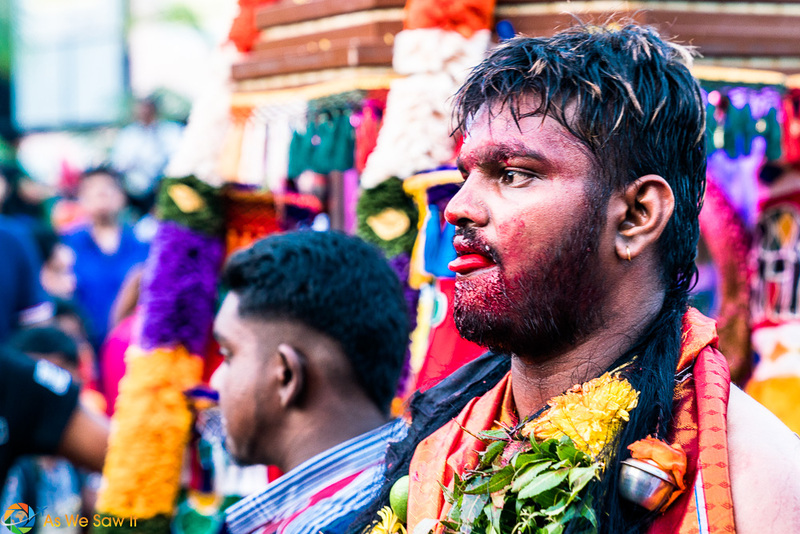 Part of Thaipusam is self-mutilation as a form of suffering for the gods out of gratitude for what they did for the believers. This is the part I did not want to see, but it is part of the festival. 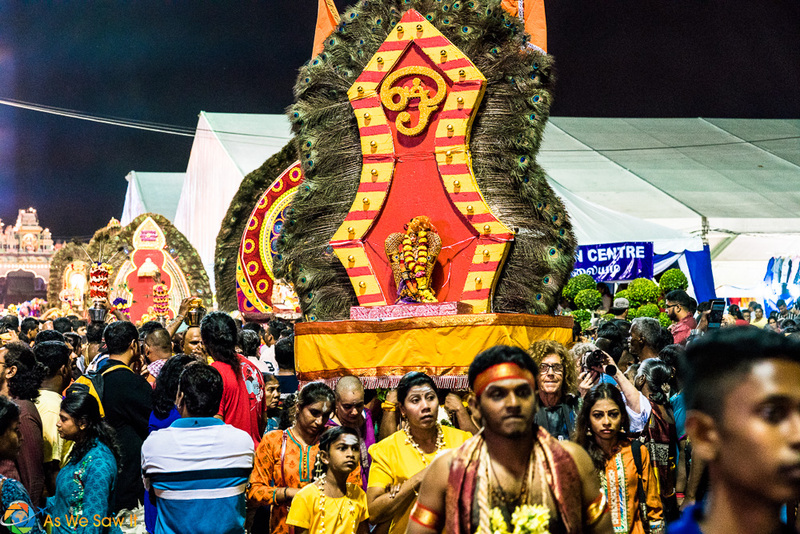 We worked our way back along the procession to the entry gates, where we found more space to photograph without becoming part of the scene. As the sun started to rise, things got easier. We were finally able to photograph the people behind the burdens. This guy who is carrying the burden is also pierced as well. Sit out of the way and use a zoom lens: It can bring you closer to the action without blocking the believers. It is important not to disrupt the natural flow of the event. 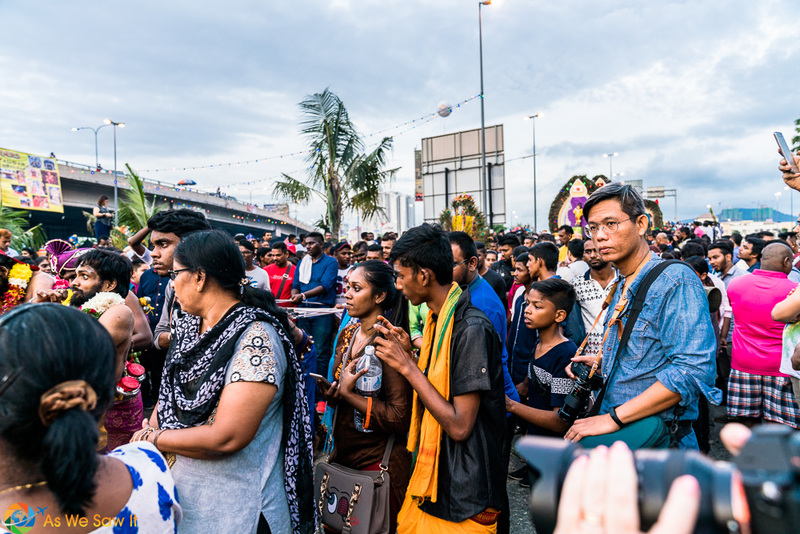 This photo gives you an idea of the crowd for Thaipusam at Batu Caves. 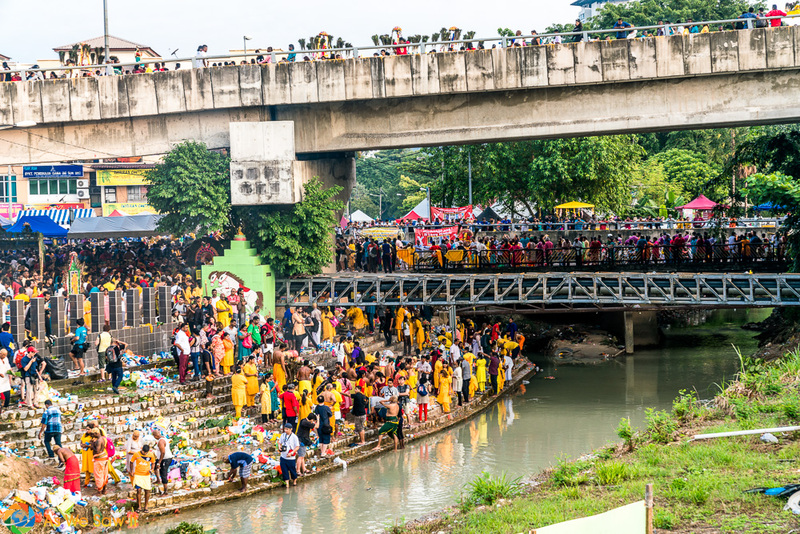 Here, devotees bathe at the river. Beyond the wall at the left, participants dress for the occasion, prepare their offerings, and perform rituals that include mutilations and piercings. Then they proceed to join the line to the cave. The line moves across the lower bridge, flows around behind us in a very large loop and crosses the river again at the upper bridge. The main entrance is out of view to the right. 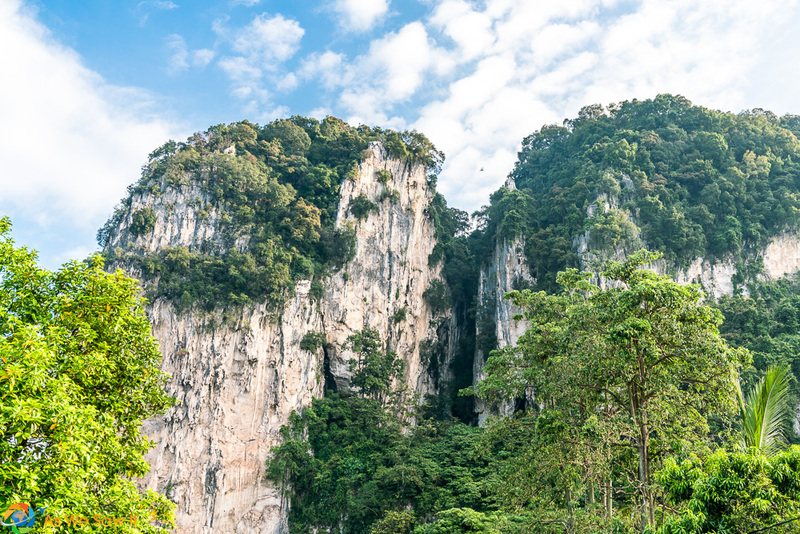 In all, it seemed about a two-mile trek to the top of Batu Caves. 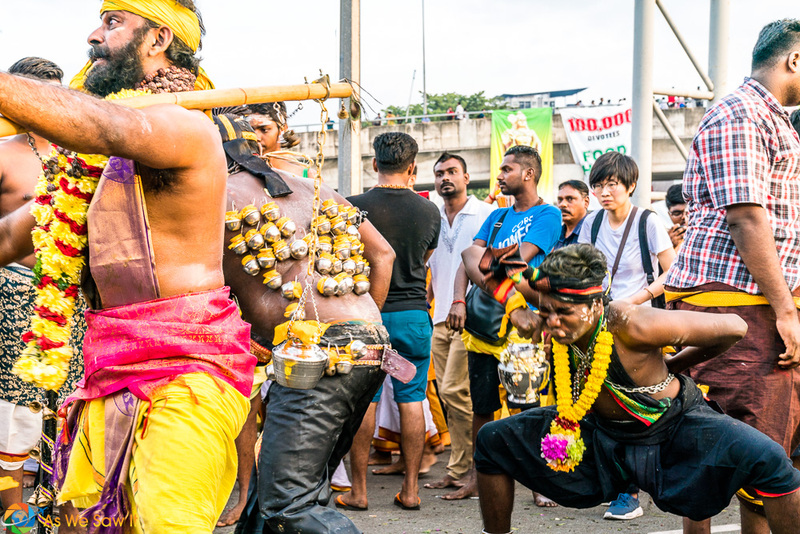 One thing we noticed on this particular shoot was the tremendous number of photographers, all there to photograph Thaipusam, all vying for the perfect position to get the perfect shot. As the sky got brighter, it revealed opportunities to capture scenes in every direction. Better chances to capture people who were before hidden behind the darkness of their burdens. The light exposed their faces and the images found their way to sensors throughout the crowd. It would seem there are almost as many photographers as there are believers. How many photographers can you count in this scene? Comment below what you find. Even with so many people trying to get that great shot, if you work the scene, you can capture unique moments yourself. 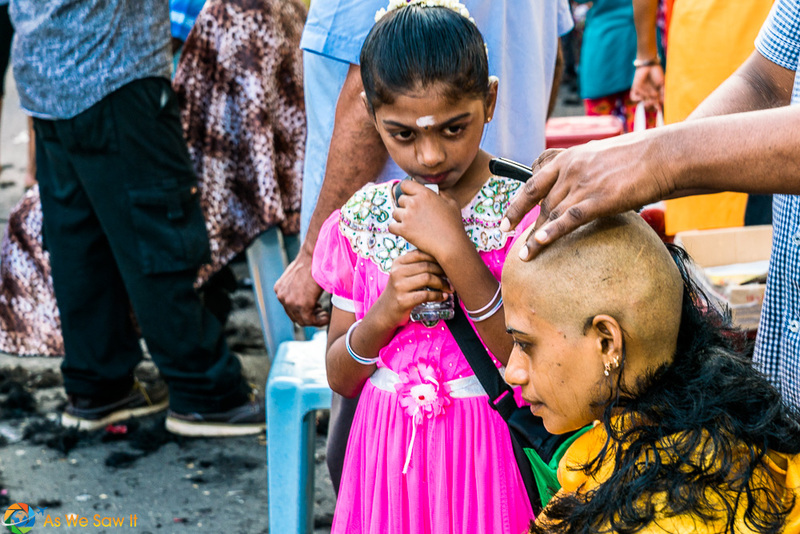 In this shot, the mother was sacrificing her long hair to the gods as her daughter looked on. Both were in tears and it would seem both were making a sacrifice. Down by the river you need to be prepared for the massive burning incense that will cloud your pictures. 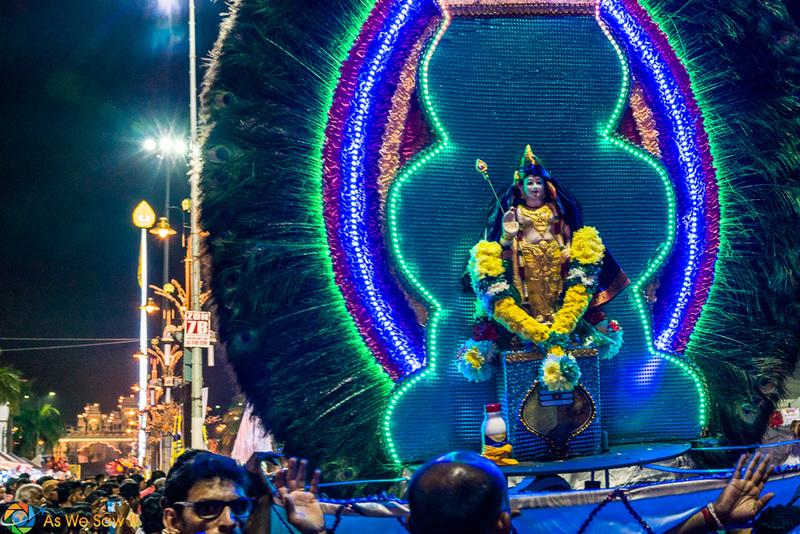 However, you can use it to your advantage in your photos and let it add to the mysticism of the event. These two characters were all dolled up for the occasion and seemed to enjoy the photographic attention. I was one among about 20 photographers. I watched them work the flock of cameras, facing each one separately as though they were there just for that camera's sensor. 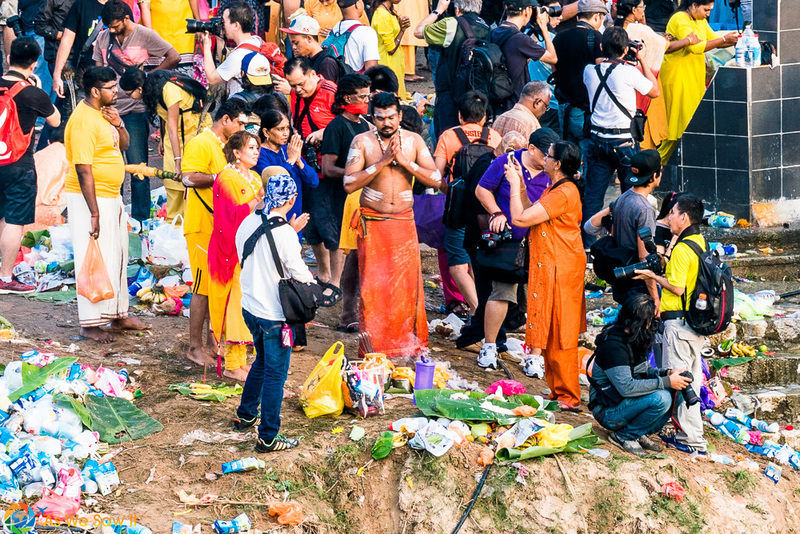 Here the image displays the intimate moment between father and son getting ready before joining the swarm of people up to Batu Caves for Thaipusam. I'm not sure they knew I was even there. A drummer glances over to the gathering of cameras during his final practice before joining the migration. 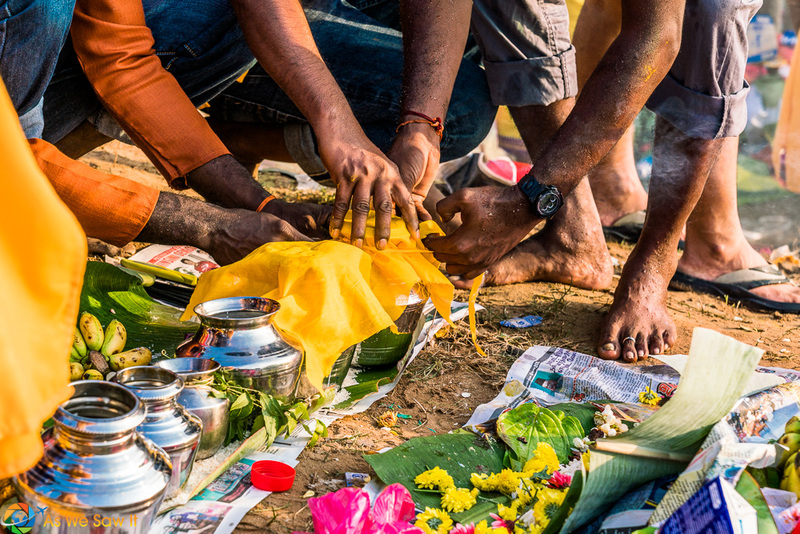 Many hands work together in preparing the offerings. In this case, one pair hold the cloth covering of a silver jar, while another pair holds the jar. A final pair ties on the cloth cover. The quality of the image may be the basis of judging a photograph, but that does not tell the story between a good photographer and a bad photographer. A good photographer not only captures stunning images, but does so in a manner that is not rude, intrusive or endangering those around. It is rather rude to shove your lens in the nose of another, especially one who is there to worship in a religious ceremony that is sacred to him, not there to model for the photographer. It is doubly rude and unacceptable to do so to a child. Keep in mind: In some countries, it is forbidden to photograph a child without permission of the parent. 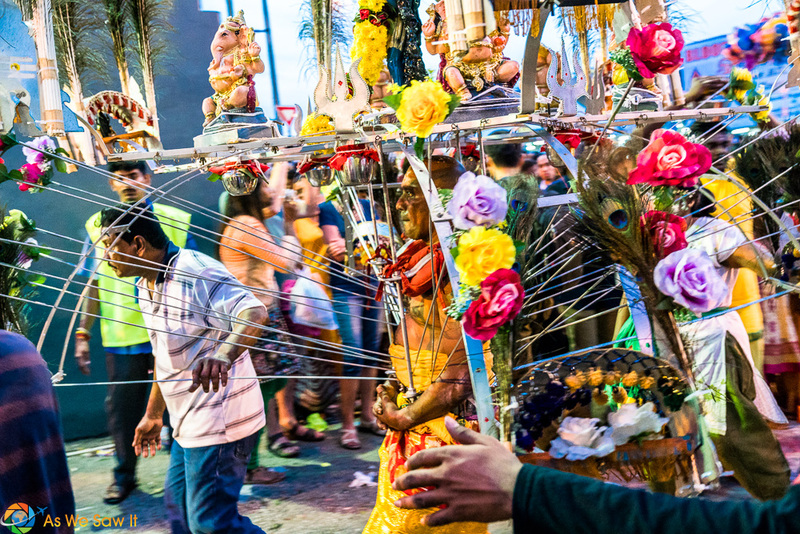 Here we see a photographer working to photograph Thaipusam properly. Notice how he moves as part of the crowd and doesn't disrupt the scene. He is obviously observing the things around him, anticipating possible moments that he can capture on his camera. 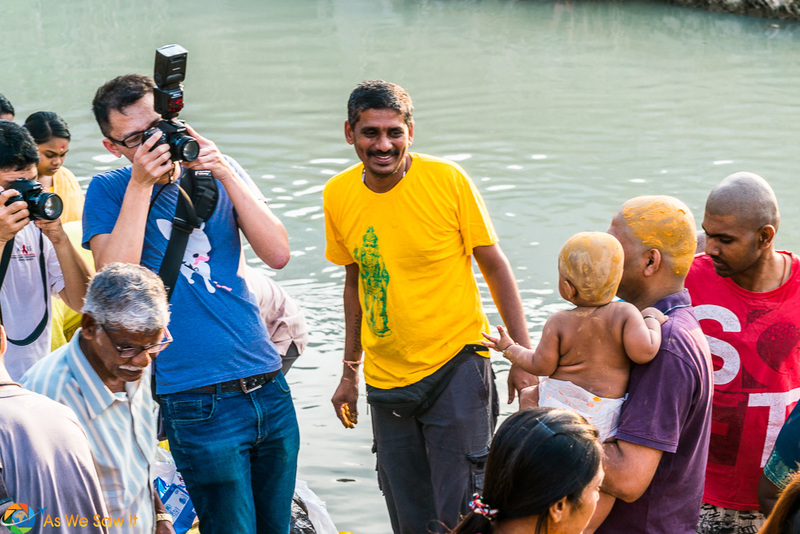 Elsewhere, some of the participants welcome the attention of the photographic crew. This man holding his child was extremely happy to get attention from the cameras. He stopped his preparations to pose for picture-taking. This is how NOT to behave as a photographer, at any event. 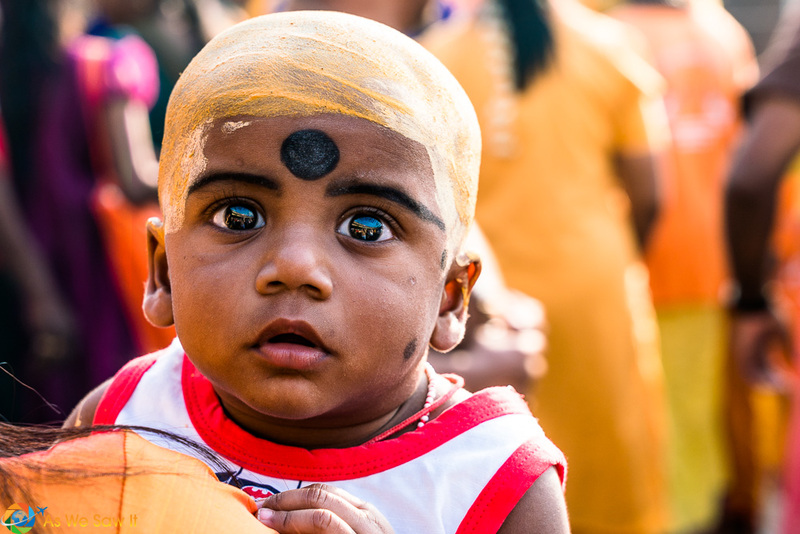 You should never stick your camera lens in someone's face, especially the face of a child! This guy was less than 8 inches from these children's faces, working down the row. After imposing his lens upon the boy, he turned to the next little girl for more practice in rudeness. At this point the mother saw what was happening and quickly ushered her children away. Please respect those you are photographing. Don't become a part of the scene, just capture it. The next several photographs are proof that you can get great photos without invading others' private space, bu using a nice zoom lens and moving around the scene. It is always important to work the scene very hard to get all angles, but to also expose yourself to possible moments to click. 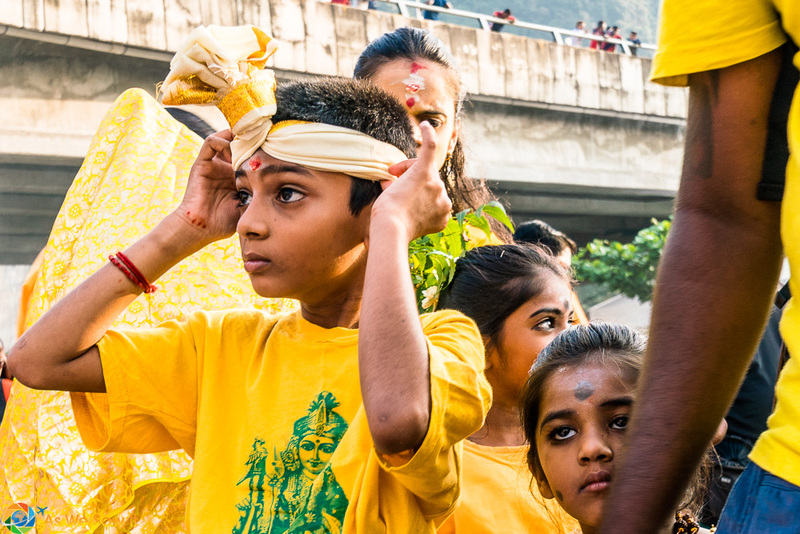 By moving a few feet to the left, I was able to capture this boy adjusting his headdress before taking his part in the ceremony. 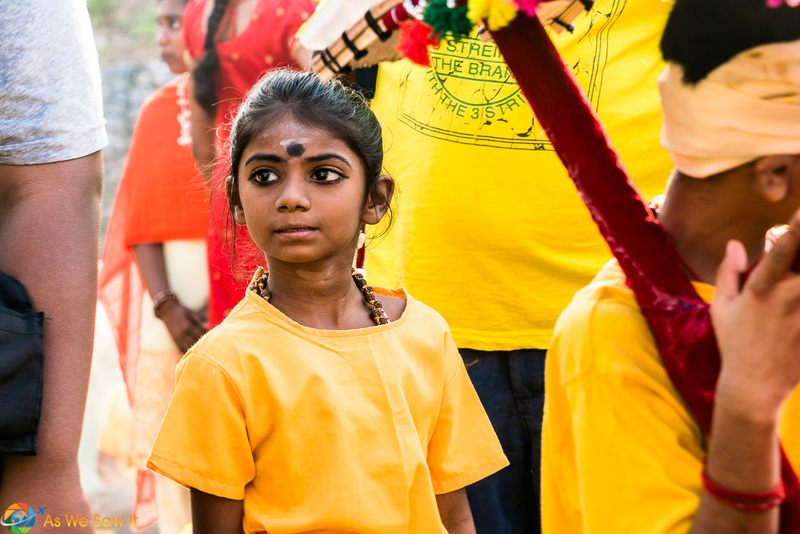 This is my favorite photo from our Thaipusam trip to Batu Caves. Not because it is a great image, but because of the memory associated with my depressing the camera button. Hide-n-seek with this child was a great memory, as was his enjoyment before I captured this fantastic shot. After working from the stairs through the crowd of more than a million people and ending up at the starting point of the flowing ocean of faithful followers, the sun had become strong and we'd exhausted 3 batteries each. One last parting shot of the cave-mountain and it was time to push through the crowd to take the train back home. Bring your fastest lens, no matter the length, for the early morning shooting. Work from the front towards the back, standing near a good light source to get the best images. Photograph the scene and don't become a part of it. Don't be an intrusive photographer, but always be aware of what is happening around you. Bring extra batteries, but leave the tripods home to avoid hurting others within the sea of people. At the end, be prepared for a massive sardine line to board the train. Better yet, pay a little extra to have private transportation waiting for the journey back. We hope this helps you prepare your own photographic adventure to a crowded place you've never been to before. If you have some more advice, boy, would we like to hear it. Just comment below. Save this for later on Pinterest and Flipboard.